My plans this week (and last) all revolve around bunnies. Even if you can’t cover “Easter”, bunnies are a great seasonal animal around which to base therapy! I let students choose the paper color they’d like. This is great for requesting. I love these foam brushed because they’re basically indestructible and coat about 6 cents each. 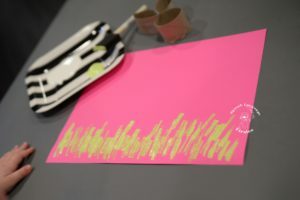 We stamped that brush upright with green paint to make grass along the bottom of the paper. This is one concept my preschoolers often struggle with. 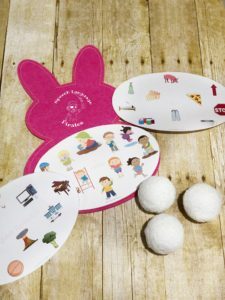 Then you go to town stamping bunnies! I just used white paint on this one, but I bet gray bunnies would look cute, too. I had students follow directions with words like “above”, “next to”, “in” the grass, etc. 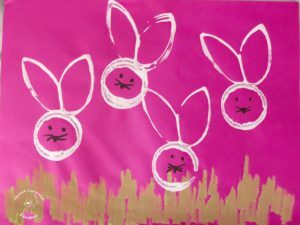 Once all of the bunnies dried, I used a marker to draw a face on the bunnies and the project was done! 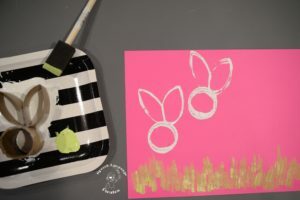 The next way I used bunnies came from the Target Dollar Spot. When I saw these adorable bunny tails, I knew I had to do something with them. I had seen people with “indoor snowballs” over the winter, and these are very similar! 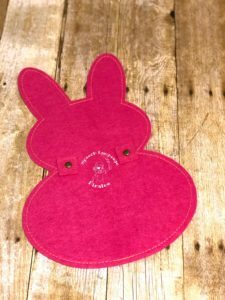 The Target Dollar Spot also these felt bunny silhouettes. 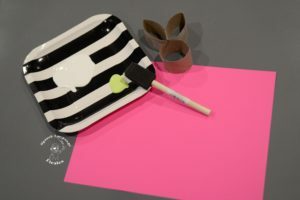 They are made to go on the back of a chair as a decoration, but I sort of disassembled them to make them work for this activity. I used scissors to cut off the loops and to remove the existing tail. 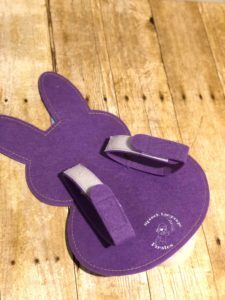 That left me with a flat felt bunny. I had the idea to throw the tails at the bunny, like you would at a target or bullseye. 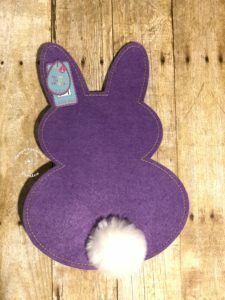 I decided to make these “targets” to go on top of my felt bunny and have students throw the tails. Wherever the tail lands, the student has to say or describe the picture underneath. 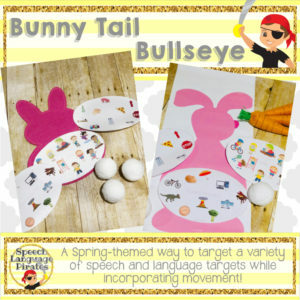 You can also place the tails all over the targets and have students walk around and take them off. 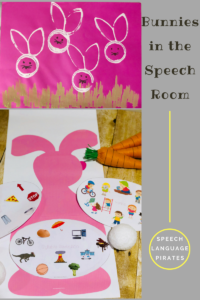 My preschoolers have both speech and language goals, so I decided to make a target for everyone! 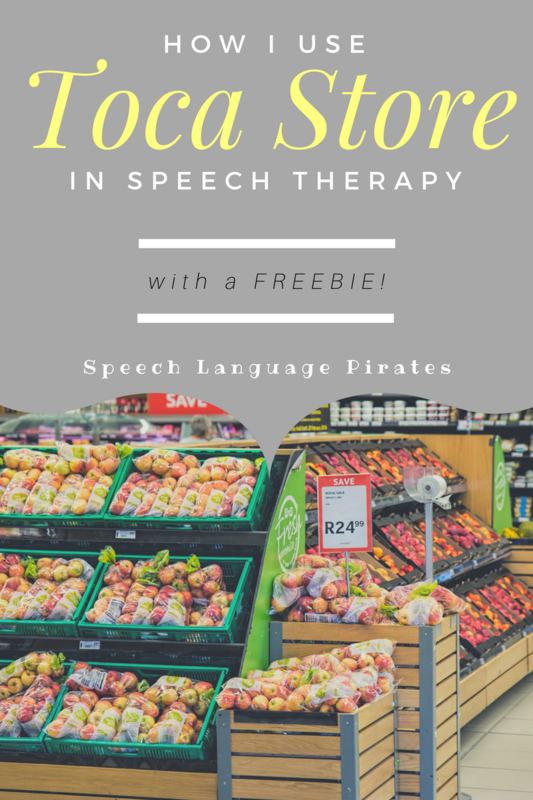 You can find this resource here, in my TpT store. 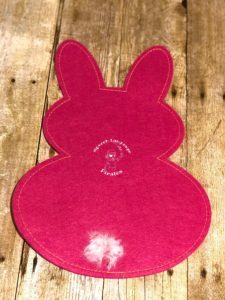 If you can’t find the felt bunnies, I’ve included a printable bunny with space for the target ovals. And if you don’t have the tails/indoor snowballs, you can also use large craft pom poms. 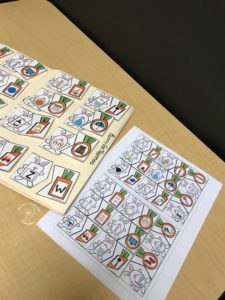 For my higher level students I’m using this free download from Kari at Rock Chalk Speech Teach. 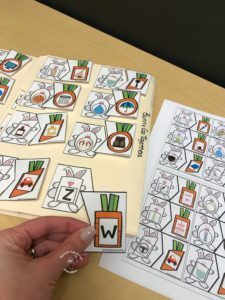 They’re adorable bunny/carrot puzzles that target associations or “go togethers”. I use them two ways. 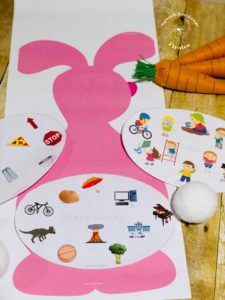 First, I printed and put all of the bunnies into a file folder and left the carrots moveable with hook and loop fastener. 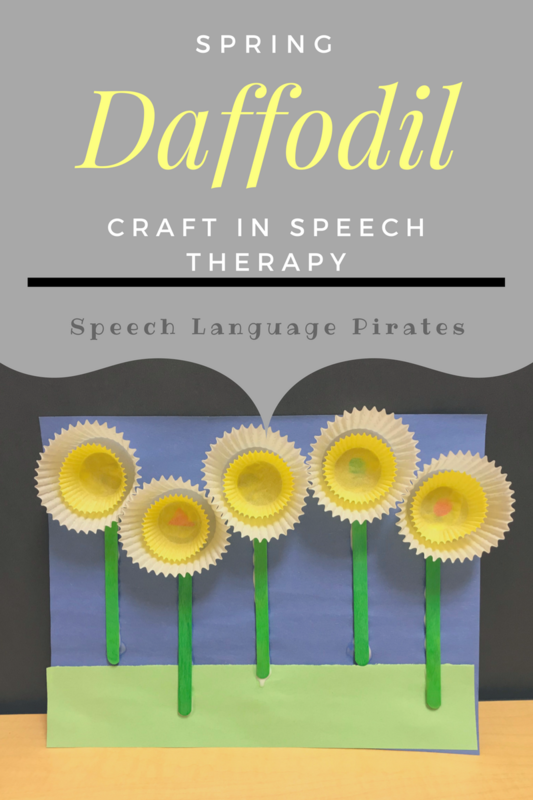 Then, I print them on half a page, cut them out, and glue them into students’ “speech notebook”. 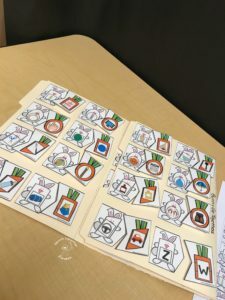 We match the objects right into the books and then parents can see them and use for carryover at home! 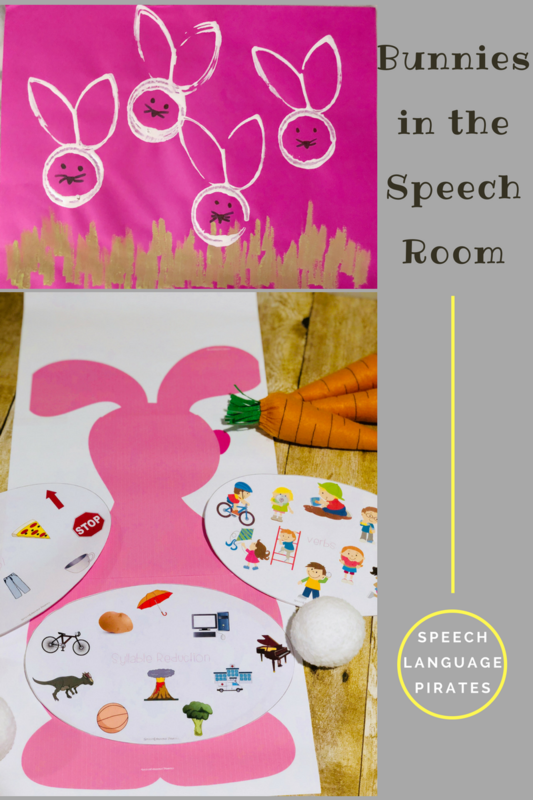 That’s all for the bunnies in my speech room! If you’re on Spring Break now – enjoy! If you’re like me and waiting for Friday – just a couple more sleeps!